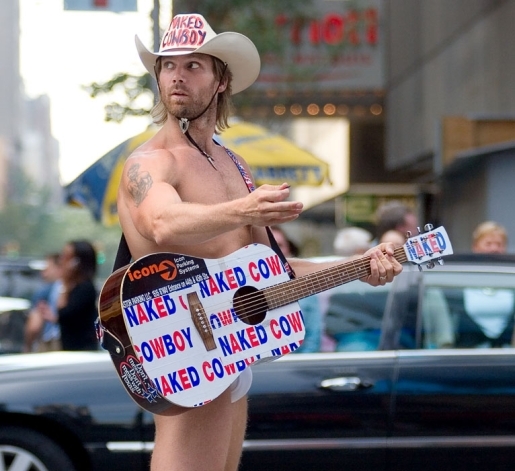 The Naked Cowboy, a busker named Robert John Burck who roams around Times Square strumming a guitar in nothing but a cowboy hat and a pair of white briefs, is a New York institution. Everyone knows him, even if not everyone loves him. He’s become so successful that he’s even spawned an imitator, The Naked Cowgirl AKA Sandy Kane (or Sandra Brodsky). That’s right, someone stole the Naked Cowboy‘s gimmick, so now he’s taking her to court! Sandy Kane is being given a couple of options. She can become a Naked franchisee for $5000 a year (or $500 a month), or they can go to court and see who has the right to wander around Times Square in a hat and very little else. He’s already taken the first step, which is filing a cease-and-desist letter. For her part, Ms. Kane says that running around in your underwear is not a copyrightable gimmick, and as such she owes Burck absolutely nothing. It’s a winner-take-all battle for the tanning lotion!